The mayor of North Bergen, who for years also served as a leading school administrator, has 10 relatives working for the education system, an affiliated public technology school, and the town, according to public records. A close associate of Democratic Mayor Nicholas Sacco at the Board of Education has 11 of her relatives in local tax-payer funded jobs, most with the North Bergen school system. Some political allies of the mayor also have numerous relatives working jobs inside North Bergen’s Board of Education and with the town. Insiders claim nepotism – even corruption - are problems inside the North Bergen Board of Education. An I-Team search of public records found Sacco’s 10 relatives earn $800,000 in taxpayer dollars each year, not including benefits. For example, Sacco’s son and daughter-in-law are both employed by the school system, earning $210,000 annually. Sacco has been mayor in North Bergen for nearly 30 years. He had also worked as a school administrator for three decades earning a top salary of about $260,000 in addition to his work as a state senator. Kathy Somick worked alongside Sacco at the Board of Education. Records show nine of her relatives have jobs at the schools. Somick’s son Edward is a vice principal. His wife and his ex-wife also have jobs. Somick’s two other sons Steven and James also are employed inside the school system, records show. A fourth son, Walter, has pleaded not guilty to criminal charges he falsified time sheets in his job at the North Bergen parks department. "When you see it laid out that way, it shows pretty clearly that there is favor and nepotism being given to family of people who are political allies of Nick Sacco," said one insider who spoke on condition of anonymity, fearful of retaliation by the mayor or his allies. "The way that he wields power is through patronage, the use of favors, job placement and the brokering of loyalty," the worker said. Dozens of taxpayer-funded jobs in North Bergen and Hudson County are held by relatives of Sacco as well as his associates' relatives. Numerous of those jobs have been publicly disclosed with the New Jersey Department of Education. 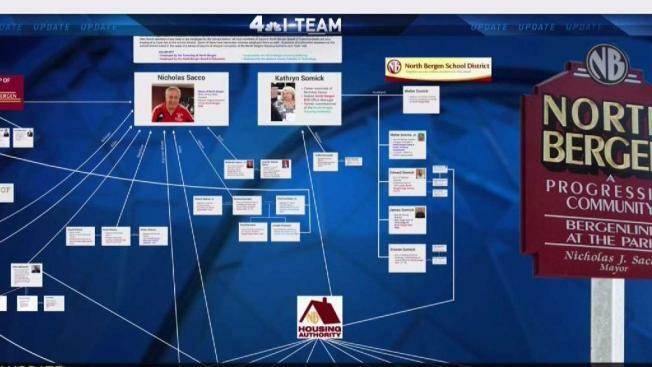 Based on official public records and social media accounts, the I-Team has created this interactive political network that highlights Sacco’s ties inside the town’s schools and Hudson County. You can choose to view it full screen and navigate through the presentation. Use the right arrow for a pre-programmed navigation (left arrow takes you back one step). On a mobile device, the right side of the screen acts as the right arrow. Sacco associate Hugo Cabrera is the North Bergen Parks Commissioner. Cabrera earns $14,500 with the town and another $173,000 as a secretary for the Board of Education. He also sits on the board of the Hudson County Schools of Technology. Cabrera’s wife, son, daughter, sister and brother work for the North Bergen Board of Education. Their salaries add up to more than $500,000 a year, the review of public records found. Sacco’s Public Works Commissioner Frank Gargiulo makes $14,500 from the town. Gargiulo is recently retired from the Schools of Technology where some buildings carry his name. He had been earning $270,000 per year in that post. Records show Gargiulo’s two daughters work for North Bergen’s education system. He also has a niece working at the Schools of Technology. And Gargiulo has a son-in-law who had jobs at both the board of education and the town. "There is a pattern here that I think cries out for investigation," said former U.S. Attorney Chuck Rosenberg who is also and NBC News legal analyst. "It is possible the mayor’s relatives and friends are superbly well qualified for these jobs. And it is also possible they are not, and that they are there for another reason," Rosenberg said. Rosenberg added he believes that the FBI, IRS and U.S. Attorney along with state investigators should likely want to review how these dozens of jobs were awarded. Others speaking on condition of anonymity tell the I-Team that pressure exists to show loyalty to the mayor. Multiple current and former educators and law enforcement officials in Hudson County claim their employment in North Bergen is contingent on making campaign contributions, helping get the vote out on Election Day, and personally attending the mayor’s fundraisers, including his annual ball. Mayor Sacco declined repeated requests for an interview. In a statement, his spokesman Phil Swibinski said the News 4 I-Team is "either fundamentally biased and part of a political smear (by Sacco opponents), or incompetent." Swibinski added in a follow-up letter that no one is forced "to engage in political activity of any kind." He added family members often follow relatives into stable public service jobs in any city or town. To read the full statement from a spokesman for the mayor, click here. Last month, at the mayor’s annual fundraising ball, some teachers voiced support for Sacco. "We have to support our town. We have to support our officials. And we are happy to do it. And we do it every year." Another added. "This is our tenure year so it’s important to be surrounded by all the members of the board. It’s important for us." But others who didn't want to go on camera pointed to other examples of concern. John Belluardo is chair of the North Bergen Democratic Municipal Committee, a political fundraising group with close ties to Sacco. Records show Belluardo earns $193,000 at the board of education and has another job working as a housing inspector in North Bergen. He has three relatives with positions tied to the schools. "Political patronage is not new in our country," former prosecutor Rosenberg said. "The important question here is whether the mayor is getting some improper benefit from placing people in these jobs." The mayor’s spokesman wrote a letter to News 4 New York management complaining the I-Team likely used a convicted felon and a lead political opponent as sources for this report. That claim is not true, as neither were among the current and former employees contacted for this report. Emails and calls to each person named in this report either declined comment or pointed us to the mayor’s spokesman for comment.